Although there are some well-known examples of terrestrial bioluminescence, such as fireflies and "foxfire" (fungus glowing on wood), the vast majority of luminous organisms make their home in the ocean. This is especially true in the dimly-lit midwater zone (100-1000 meters deep) where biologically produced light can outshine what light has filtered down from the surface. In fact, in this region, it has been estimated that 90% of the fish and crustacean species are capable of making light, and the numbers for jellies are even higher. Although it is sometimes assumed that these animals get their luminescence from bacteria, the surprising truth is that nearly all of them (with some notable exceptions) produce at least one of the chemicals required to glow. Despite this huge diversity of luminous phyla, most of which are thought to have evolved luminescence independently, there is low diversity of luciferins in the sea. Most phyla use one of four light-emitting substrates, with coelenterazine being the most widely distributed. Part of this convergence may be explained by dietary links, where an organism receives its luciferin from its diet, but evolves its own enzyme and photocyte system to control the emission of light. In this way selection acts primarily through the genes coding for the proteins, specifically the luciferase or photoprotein. (a) Chemiluminescence. Excitation and the resultant light production come as the result of a chemical reaction, as in glow-sticks (Figure 1a). Bioluminescence can be considered a subset of chemiluminescence: light produced when such a chemical reaction occurs within a living organism. (b) Fluorescence. Excitation occurs as the material is being hit by incident light of particular wavelengths. The molecules are not stable in this excited state and as they return to their ground state, the energy is almost immediately re-emitted in the form of a longer wavelength photon. In Figure 1b, green-fluorescent protein from the hydromedusa Aequorea is being excited by blue light. As with chemiluminescence, bioluminescence is related to fluorescence, in that many luminous molecules may also be caused to fluoresce. Other examples are "blacklight" effects and the red fluorescence from chlorophyll. (c) Phosphorescence. In the past, this term was used as a synonym for sea-water bioluminescence, but the scientific meaning is quite different. Phosphorescence is similar to fluorescence in that excitation occurs when the material is hit by light. The molecules, however, are somewhat stable in their excited state, and re-release the energy gradually over time, resulting in a dim steady glow. The most familiar example of phosphorescence is glow-in-the-dark stickers. (d) Iridescence. Incident light strikes a thin reflective surface, and an interference effect results in particular wavelengths to be favored by certain thicknesses. The pale pink and green sheen caused by a film of oil on water results from such an effect. Other thin film iridescence is seen in some sea shells and marine algae, soap bubbles, sapphirinid copepods, and butterfly wings. (e,f) Scattering. Much like when light passes through a prism, a grating of finely ruled, regularly spaced grooves can separate light into its component wavelengths. 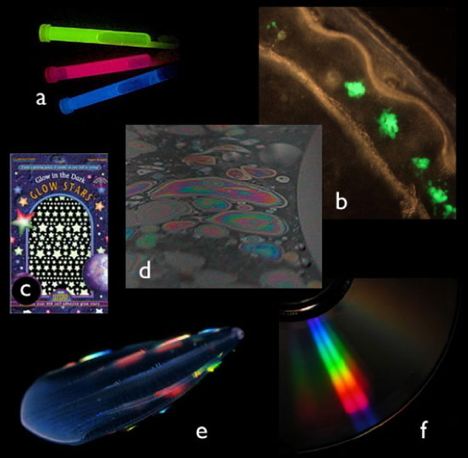 This is commonly seen with a compact disc (Figure 1f), and a similar phenomenon is thought to be how ctenophore comb rows separate the incident light into a brilliant rainbow (Figure 1e). There are many other optical phenomena (triboluminescence, prismatic effects, electroluminescence, incandescence), but these are not typically confused with bioluminescence, so they will not be described here. In short, bioluminescence is the production of light from a chemical reaction (usually enzyme-mediated oxidation), which occurs inside an organism. Figure 1. Optical phenomena other than bioluminescence. Each of these examples shows an intriguing, colorful display, but they are not bioluminescence. (a) chemiluminescence, a chemical reaction not in a living organism; (b) fluorescence, light emitted from an excited state that was created by incident light; (c) phosphorescence, similar to fluorescence, but the light emission is delayed from the time of light absorption; (d) iridescence, a combined effect of reflection and interference that causes different colors to be seen at different viewing angles from a surface; (e & f) other scattering effects, spatial separation of light into different wavelengths, as from a prism or diffraction grating. (e) is the comb jelly Beroe, and (f) is the surface of a compact disc. How Can we Study Bioluminescence in Marine Creatures? The first requirement is to have intact specimens; beaten-up ones have generally used up their stores of luminous material. This is one of the reasons why the bioluminescence of a common deep-sea chaetognath went undiscovered for 90 years after the species had been described. Only after it had been seen luminescing from a submersible at 700 meters did anyone know to examine it more closely. For many animals, you must hand-collect them or use a submersible (manned or remotely operated) to get them in good shape (Figure 2). This applies to shallow-living animals as well; crude collection techniques give crude results. An accurate understanding of ephemeral phenomena such as bioluminescence requires appropriate techniques. Figure 2. 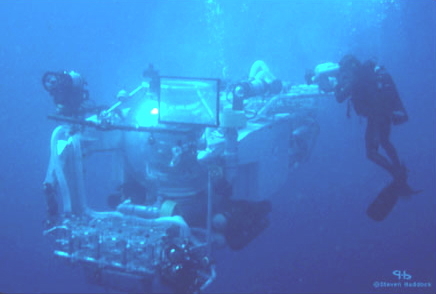 Scuba diving allows researchers to collect fragile luminous organisms from surface waters, however, the collection of deep organisms requires submersibles, either manned or remotely operated equipment. Aequorea victoria is probably the "world's most famous jellyfish," or if it is not, at least it should be. This species was the original source for the purification of calcium-activated photoproteins, and, if that weren't enough, it also provided the original source of green-fluorescent protein (GFP). Both of these molecules have played a role in revolutionizing the study of biology. Photoproteins are used as calcium indicators, and in enzyme quantification assays known as FRET (fluorescence resonance energy transfer). GFP has become a ubiquitous marker for gene expression in molecular biology labs, and in 2008, the discovery of GFP won the Nobel Prize for Drs. Shimomura, Chalfie, and Tsien. Once the original photoproteins and fluorescent proteins (FPs) were discovered, the search was on for other homologous molecules with different properties. The cloning of red FPs from non-luminous Anthozoa (corals and sea anemones) has broadened the palette of tools which are at our disposal. Figure 3. Left: The hydromedusa, Aequorea victoria, from Puget Sound, Washington, USA under normal illumination. Right: At the top, the bioluminescence from this organism. 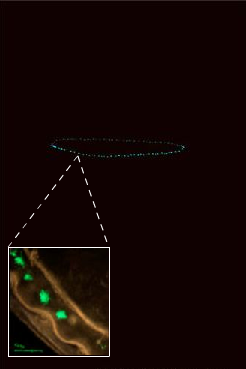 The inset shows the view through a fluorescence microscope showing GFP localized at the bell margin. Although the microscope is "lighting up" the fluorescent proteins, this is also generally the location of the photoprotein-bearing bioluminescent cells. This list is intended to give an idea of the diversity of bioluminescent creatures. If an organism is listed here, it means that at least one species in that group is luminescent. The list is not meant to be comprehensive, and there may be other luminous creatures that are not included here. Marine species not known to be luminous, but cause "foxfire" when certain species grow on wood. If you see luminous sparkles in the wake of a boat, or in splashing waves on the beach, it is probably coming from dinoflagellates. These single-celled protists can be photosynthetic, or they may be heterotrophic (eat other organisms), or some combination of the two. They may become very abundant during red tides, and are thought to use their light as a burglar alarm to attract predators to animals that are grazing on them. Common in shallow oceanic gyres and in deep oceans, these single-celled organisms are like amoebe living in glass houses. Surprisingly, they use calcium-activated photoproteins much like hydromedusae. 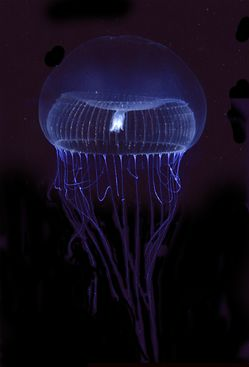 Bioluminescence is widespread in all major Cnidarian groups except for the Cubozoa. Different species employ photoproteins or a variety of luciferases to trigger luminescence from coelenterazine. The luminous groups include Scyphozoa ("true" jellyfish), Hydrozoa (hydroids, siphonophores, and hydromedusae), and Anthozoa (sea pens and sea pansies). Comb Jellies are almost all bioluminescent, with the exception of the sea-gooseberry, Pleurobrachia, and some benthic species. Like hydrozoa, they use photoproteins with coelenterazine to make light. Some species secrete luminous material into the water when disturbed. One species of interstitial ribbon worm is known to have luminous symbionts. An impressive variety of molluscs are able to make light. From the only freshwater limpet (1 type) to a few types of nudibranchs and clams, bioluminescence has evolved several times in this phylum alone. The cephalopods have the most advanced luminescence systems, and some squids may have three or more types of luminous organs. Even a few pelagic octopods have gotten into the game. Within the segmented worms, many types of marine polychaetes, both benthic and pelagic, produce light. Some interesting examples include the "fireworms" which use luminescence as part of their mating display, and Tomopteris, which makes yellow light. On land, some oligochaetes (earthworms) are even able to produce luminous secretions. Most pelagic crustacean groups (with the exception of isopods) have luminous members. These include copepods, ostracods, amphipods, decapod shrimp and euphausiids (krill). Amazingly, three of the major marine luciferins are used in various crustaceans (ostracod-type luciferin, dinoflagellate-type luciferin, coelenterazine). Crustaceans are also the most likely source for coelenterazine in the sea, as there is evidence that they can produce it. At least one species of deep-sea arrow-worms has been shown to be bioluminescent. Interestingly, it also uses coelenterazine to make its light. Within the echinoderms, luminescence is prominent among brittle-stars (Ophiuroids) and sea cucumbers (Holothuroids), but there are even some sea stars (Asteroidea) which can make light. They too are luminous. The most commonly found is the enteropneust tornaria (larva) of a hemichordate worm. Bioluminescence has probably arisen at least three times in the evolution of urochordates, because it takes different forms in the different groups. Pyrosomes produce very bright, long-lasting light which can be stimulated by flashes of light. They are suspected to use bacteria to glow. One benthic tunicate is luminous, and most larvaceans embed luminous particles into their mucus "houses." Many kinds of fish are covered in photophores. They use them for counterillumination, defense, and finding food. Some even have evolved a combination of intrinsic and bacterial light organs. A few sharks, such as the cookie-cutter shark, have luminous organs, and the enigmatic "Megamouth" is said to have photophores on the inside of its mouth. Many deep-sea animals appear to have conspicuous red coloration, especially surrounding their stomachs. Why do they do this, and how do they get away with appearing so conspicuous without being devoured by predators? • By the time it reaches the deep-sea, light has been filtered to blue-green wavelengths. In addition, nearly all bioluminescence has the same wavelength as the downwelling light. • Things look red because they absorb everything except red light. Specifically, they absorb blue light. • Having a red stomach means that you are absorbing any blue light, which your dinner is emitting. Of all the luminous organisms in the sea, only a few are thought to use light to lure prey, and fewer still have been known to make red light. Recently, a siphonophore has been discovered that does both: it uses small glowing "lures" to attract prey. So what is a siphonophore? Siphonophores are in the phylum Cnidaria, which includes corals (Anthozoa), and the familiar "true" jellyfish (Scyphozoa). Siphonophores are within the Hydrozoa, which includes hydroids that grow on rocks, as well as the small and transparent jellies called hydromedusae. They are not, as some might tell you, colonies of single-celled organisms, nor do they "come together" to form a colony. For our purposes, it is easiest to consider them as a single "superorganism", which grows by budding off specialized polyps and medusae (Figure 4). (Coloniality comes in when you consider the polyps as individuals.) Each type of polyp has a special function, including feeding, buoyancy, propulsion, and reproduction. Figure 4. Siphonophores can be considered as "superorganisms", which grow by budding off specialized polyps and medusae. Each type of polyp has a special function, including feeding, buoyancy, propulsion, and reproduction. Of special interest here are the feeding polyps, known as gastrozooids. In the genus Erenna, each gastrozooid has a tentacle that branches off of it from the base. 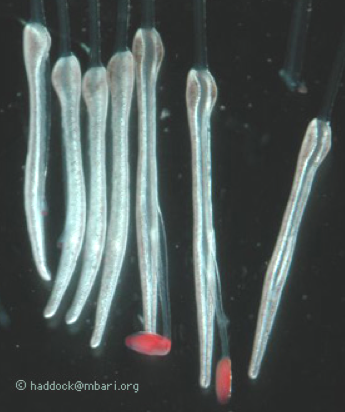 This tentacle, in turn, has side branches called tentilla, which hold the stinging cells. 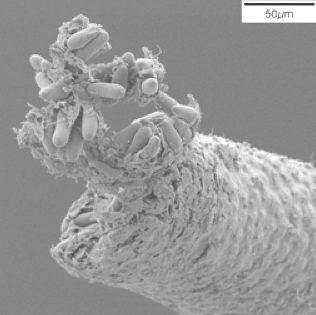 Figure 5 shows an electron micrograph of the tip of one of these tentilla. 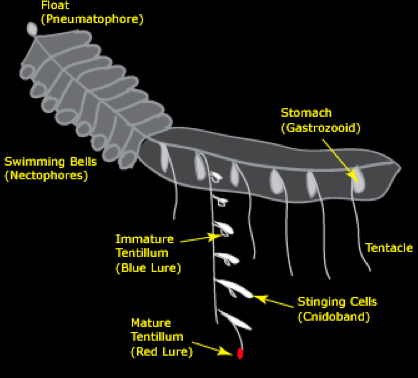 The tubular capsules are the stinging cells. Figure 5. In the genus Erenna, each gastrozooid (feeding polyps) has a tentacle that branches off of it from the base. This tentacle, in turn, has side branches called tentilla, which hold the stinging cells. Most siphonophores catch prey by putting out their long tentacles and waiting for something to bump into their tentilla -- think of a spider web, which is also laced with stingers. But not all siphs operate in this way. Using MBARI's deep-diving remotely operated vehicles, we found a new species in the genus Erenna. Siphonophores like Erenna, especially the new species in question, don't seem to follow this same passive mode of operation. When seen from a submersible, this species holds its tentacles close to its body. On the face of it, this would not seem to be an efficient feeding strategy. What makes this species more unusual is that it is known to feed only on fish, and it lives more than 1600 meters deep, where fish and other organisms are relatively scarce. So without a web, how does it catch its food? A clue is found in the arrangement and "behavior" of the tentacle side branches, shown in Figure 6. The side branches include a large battery of stinging cells attached to a central stalk. Several examples of these are shown at the right of Figure 6. 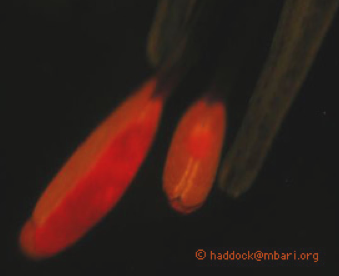 At the end of the transparent stalk is a red "lure" which starts out small with a white center. The white material consists of bioluminescent material. As the small lure matures, it gets larger and the white material becomes surrounded by red fluorescent material. Figure 6. Tentacles of siphonophores. Based on the emission and excitation spectra of this red substance, blue light emitted at the center of the lure would be expected to excite the fluor and produce orange-red light. This wavelength of light is very unusual in the ocean for two reasons. One is that it doesn't penetrate very far: meters or several centimeters rather than tens of meters. Because red light is rare, it is not surprising that the eyes of deep-sea organisms have only rarely been found to be sensitive to red light. The lures are not just capable of producing light, but the transparent stalk also contracts rapidly to flick the lure. This behavior is eerily similar to the motion of many deep-sea copepods. Often they are seen to do a "hop and sink" behavior where they alternate between rapid jumps and slow sinking behavior. If a copepod-eating fish were able to see the motion of the lure, it would almost certainly be a tempting target! For a jellyfish to have a lure is unusual enough; only anglerfish and a few squid have been suspected to use luminescence as a lure in the sea. But because so few fish see red light, there is additional resistance to the idea of a jelly using long-wavelength light in its luminous lure. 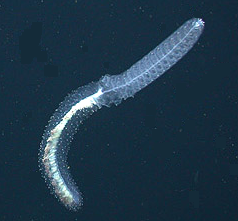 The most likely target species for this deep-living siphonophore are small (few centimeter long) bristlemouth fish in the family Gonostomatidae. Because the deep sea is so vast -- about 10x larger than the next-largest habitable volume -- the most common of these fish, Cyclothone, is probably the most common vertebrate on the entire planet. Despite its abundance, its visual pigments have never been measured; their eyes are extremely small and they are too fragile for many deep-sea trawling operations. If any fish were to "slip through the cracks" of our scientific knowledge and have a hidden ability to see red light, then Cyclothone would be a great candidate. Even if we accept that this ability might go undetected, this still leaves the question of why a deep-sea fish would need to detect red light. One possibility is that it is using the ability to detect prey. Red fluorescence material (Figure 7), especially derived from plant chlorophyll, is common in the ocean, including the deep sea. Marine snow from more than 2000m deep still produces red fluorescence when illuminated with blue light. With a yellow filter in their eye, or visual pigments able to distinguish short and long wavelength light, a fish would see anything red as a conspicuous target over short distances. Light to excite fluorescence would have to come from ambient blue light (at shallower depths) or from bioluminescence itself. Figure 7. Fluorescence of Erenna tentilla. The use of a dim red lure in the deep sea is almost impossible to observe undisturbed. Any illumination would obviously affect the visual environment, and a low-light camera would be hard pressed to find these rare siphonophores, let alone document a feeding event. Nonetheless the most conservative interpretation of the evidence seems to be that this jelly dangles red lures to attract its prey. If more specimens can be obtained, there are many avenues for further study of this special function of bioluminescence. Bioluminescence has evolved more than 40 times, and in some phyla such as Mollusca and Annelida, chemical reactions that produce light have evolved independently at least three times. As complex as it seems to make biological light, it must not be that difficult, because it has happened so many times. On the other hand, bioluminescence must serve important ecological roles, given its widespread taxonomic distribution in the ocean. Many fascinating questions remain to be answered, including many uncharacterized luminescence chemistries, and a range of ecological functions. Campbell, A. K., and P. J. Herring. 1990. Imidazolopyrazine bioluminescence in copepods and other marine organisms. Mar. Biol. 104: 219-225. Douglas, R. H. and others 1998. Dragon fish see using chlorophyll. Nature 393: 423-424. Douglas, R.H., J.C. Partridge, and N.J. Marshall (1998) The eyes of deep-sea fish. I: Lens pigmentation, tapeta and visual pigments. Prog. Ret. Eye Res. 17: 597-636. Douglas, R.H. and J.C. Partridge (1997) On the visual pigments of deep-sea fish. Journal of Fish Biology 50:68-85. Haddock, S. H. D., and J. F. Case. 1994. 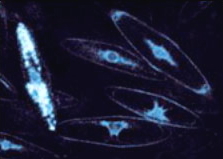 A bioluminescent chaetognath. Nature 367: 225-226. Haddock, S. H. D., and J. F. Case. 1999. Bioluminescence spectra of shallow and deep-sea gelatinous zooplankton: ctenophores, medusae and siphonophores. Marine Biology 133: 571-582. Haddock, S.H.D., C.W. Dunn, P.R. Pugh. and C.E. Schnitzler. 2005. Bioluminescent and red-fluorescent lures in a deep-sea siphonophore. Science. 309: 263. Haddock, S. H. D., J. F. Case, and C. A. McDougall. 2009. The Bioluminescence Web Page. Haddock, S. H. D., T. J. Rivers, and B. H. Robison. 2001. Can coelenterates make coelenterazine? Dietary requirements for luciferin in cnidarian bioluminescence. Proc. Nat. Acad. Sci. 98: 11148-11151. Haddock, S. H. D., M. A. Moline, and J. F. Case JF. 2010. Bioluminescence in the sea. Ann. Rev. Mar. Sci. 2: 443-493. Hastings, J. W. 1983. Biological diversity, chemical mechanisms, and the evolutionary origins of bioluminescent systems. Journal of Molecular Evolution 19: 309-321. Herring, P. J. 1977. Luminescence in cephalopods and fish. Symp. Zool. Soc. Lond. 38: 127-159. Inouye, S., and F. I. Tsuji. 1993. Cloning and sequence analysis of cDNA for the Ca2+ activated photoprotein, clytin. FEBS Lett. 315: 343-346. Latz, M. I. 1995. Physiological mechanisms in the control of bioluminescent countershading in a midwater shrimp. Marine and Freshwater Behaviour and Physiology 26: 207-218. Matz, M. V. and others 1999. Fluorescent proteins from nonbioluminescent Anthozoa species. Nature Biotechnology 17: 969-973. Morin, J. G. 1986. "Firefleas" of the sea: Luminescence signaling in marine ostracode crustaceans. Florida Entomologist 69: 105-121. Prasher, D. C., V. K. Eckenrode, W. W. Ward, F. G. Prendergast, and M. J. Cormier. 1992. Primary structure of the Aequorea victoria green fluorescent protein. Gene 111: 229-233. Prasher, D. C., R. O. McCann, and M. J. Cormier. 1985. Cloning and expression of the cDNA coding for aequorin, a bioluminescent calcium-binding protein. Biochem. Biophys. Res. Comm. 126: 1259-1268. Shimomura, O., and P. Flood. 1998. Luciferase of the scyphozoan medusa Periphylla periphylla. Biol Bull 194: 244-252. Shimomura, O., S. Inoue, F. H. Johnson, and Y. Haneda. 1980. Widespread occurrence of coelenterazine in marine bioluminescence. Comp. Biochem. Physiol. 65B: 435-437. Shimomura, O., F. H. Johnson, and Y. Saiga. 1962. Extraction, purification and properties of aequorin, a bioluminescent protein from the luminous hydromedusan, Aequorea. J. Cell. Comp. Physiol. 59: 223-239. Thompson, E. M., S. Nagata, and F. I. Tsuji. 1989. Cloning and expression of cDNA for the luciferase from the marine ostracod Vargula hilgendorfii. Proceedings National Academy of Science, USA 86: 6567-6571. Thomson, C. M., P. J. Herring, and A. K. Campbell. 1995. Evidence for de novo biosynthesis of coelenterazine in the bioluminescent midwater shrimp, Systellaspis debilis. J. Mar. Biol. Assoc. U.K. 75: 165-171. Thomson, C. M., P. J. Herring, and A. K. Campbell. 1997. The widespread occurrence and tissue distribution of the imidazolopyrazine luciferins. J. Biolumin. Chemilumin. 12: 87-91. Ward, W. W., and H. H. Seliger. 1974. Properties of mnemiopsin and berovin, calcium-activated photoproteins from the ctenophores Mnemiopsis sp. and Beroe ovata. Biochemistry 13: 1500-1509. Young, R. E., and F. M. Mencher. 1980. Bioluminescence in mesopelagic squids: Diel color change during counterillumination. Science 208: 1286-1288.